I've been trying some new products recently and I just need to tell you all about them, some I've been trying for a few months and others I've been trying for more than 3 weeks. I like to give it time before I review a product so I know the full extent of it's effects. 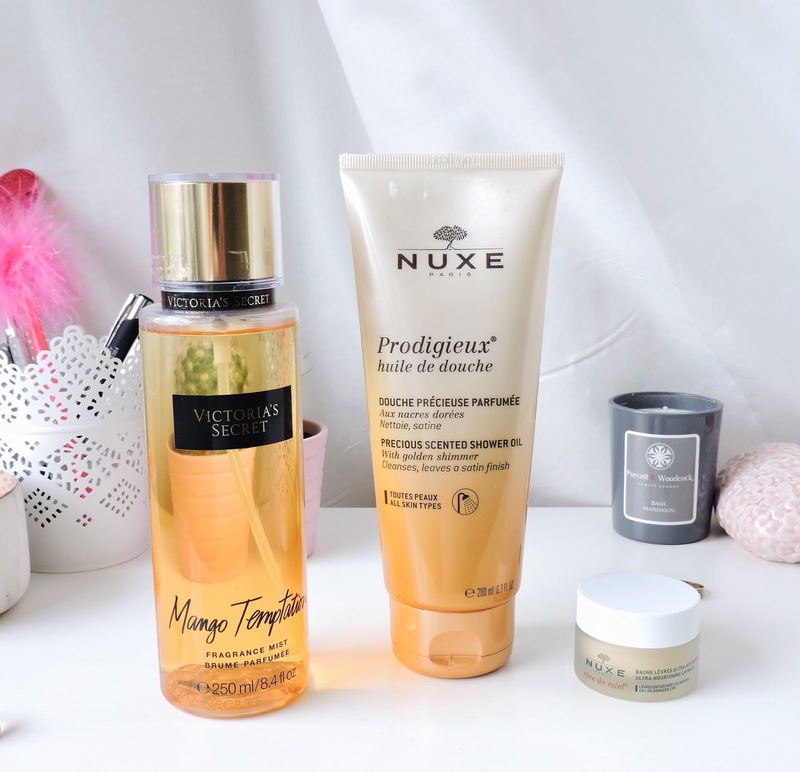 Today I am reviewing products from Vichy, Urban Decay, Moogoo, Victoria Secret, Nuxe, and Lancome. Vichy Peeling: This product is rich with glycolic acid which acts as a gentle exfoliator for the skin. I have been using this product every night for almost 1 month and I have to say I've seen a massive improvement in my skin. Before I started using this product my skin was so dry which resulted my makeup looking flaky. What I didn't realise that I had a layer of dehydrated and dead skin on top of my usual oily skin. I don't have any dry flaky skin anymore and it's looking a lot more healthy any dewy. Absolutely massive thumbs up from me. 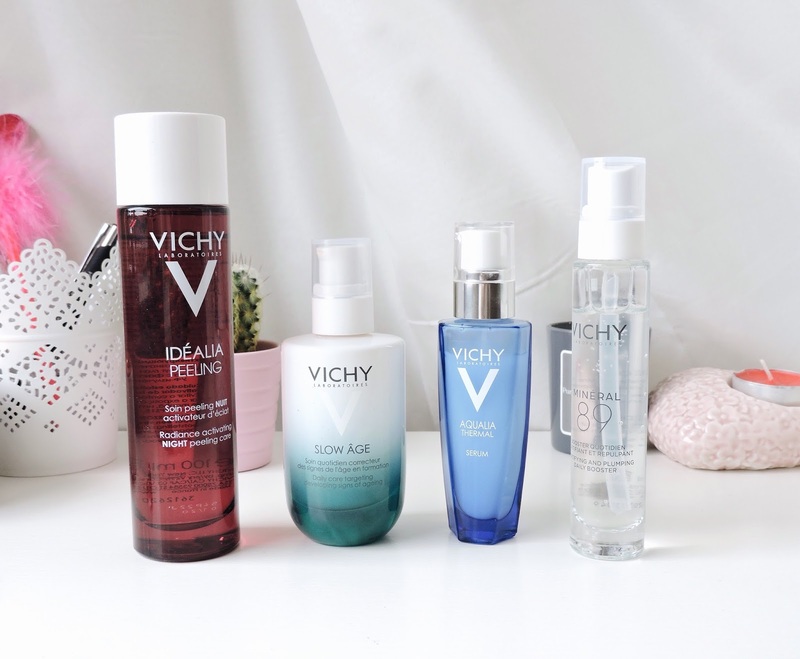 This is probably one of my favourite Vichy products I received! Note: after use always wear an SPF because of the glycolic acid present. Vichy Show Age Moisturiser: This anti ageing moisturiser contains an SPF of 25 which goes hand in hand with the Peeling tonic. However after using this moisturiser after two weeks I noticed my pores were getting a bit clogged. I presume this is because it is an anti-ageing moisturiser and my skin is not old enough to tolerate it. So I stopped using it and began using my Moogoo one (will discuss below). Overall I cannot give a good judgement of this moisturiser all I can say it obviously wouldn't benefit young problematic skin. Vichy Aqualia Thermal Serum: This is by far one of my favourite products by Vichy as well as the Peeling one. This Serum is like a huge drink of water for your skin and has definitely saved my dehydrated skin! Vichy Mineral 89: This product is said to plump the skin, the reason why I love this product is because you can use it on your eyes too. It's free from alcohol and perfumes and is ideal for sensitive skin. The only downfall about this product is that it get's used quite fast. I've been using it every day for over 3 weeks and it's already half gone. It is a great product and my skin looks a lot more plump and bright. Victoria's Secret Mango Temptation Fragrance: I'm not a massive fan of most of these sprays however when I first smelt this one I was in love. I mainly wear this if I'm running out the door and I need to smell somewhat respectable 😂 It's not as sweet as most Victoria's Secret body mists so it's definitely in my good books. Nuxe Shower Oil: When I saw this product I thought it would come out as an actual oil however it does not. It foams up too like a normal shower gel. The smell is incredible and I really am left with smooth skin. There are tiny golden sparkles in the formula and my body is sometimes left with these sparkles so that is a mega bonus for me. Nuxe Lip Balm: This lip balm is very thick in texture and is made with honey. The first few times I used this product I wasn't a fan as it just felt heavy on my lips. But after a few uses I really got used to it and I noticed my lips had stopped chapping. I have terrible lips as I cant stop biting them (an old habit) but this lip balm smoothed my lips out resulting in me stopping to bite them. I notice if my lips are chapped I will bite them. Thumbs up for me! Next up is possibly my favourite product of the whole skincare review. 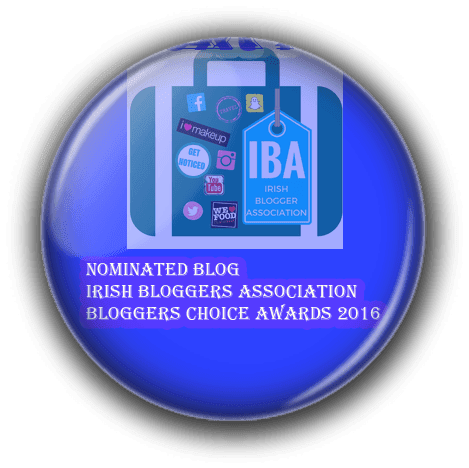 I purchased this clensing moisturiser a few months ago and I have used it every day. I love it so much and I am 100% convinced that it has prevented my skin from breaking out. I haven't had a blemish in over a month and I am convinced it is down to this. 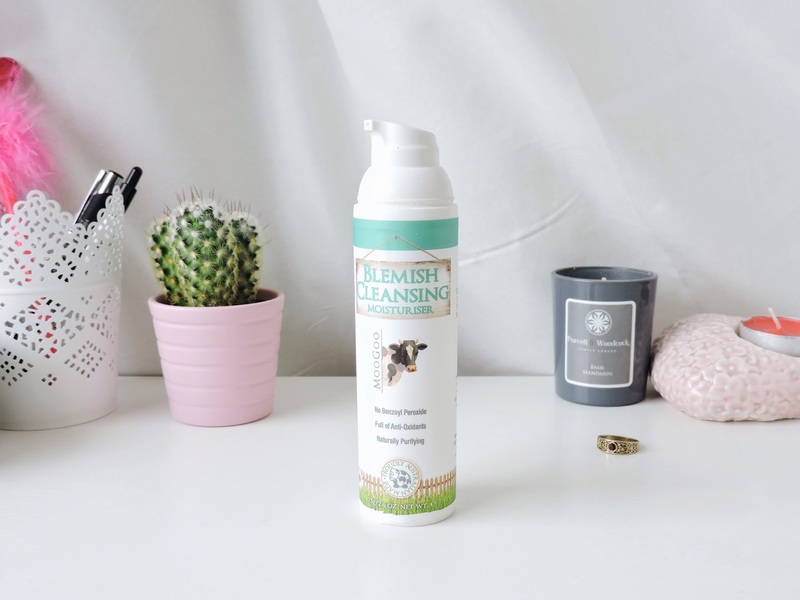 This Moogoo Blemish Cleansing Moisturiser acts as a cleanser and a moisturiser so you don't wash it off. I clean my skin and then apply this morning and night. It lasts a very long time too as I have been using this for months and it's still not empty (although I know it's on the way out) Moogoo products never fail me so I'm not surprised this hasn't! 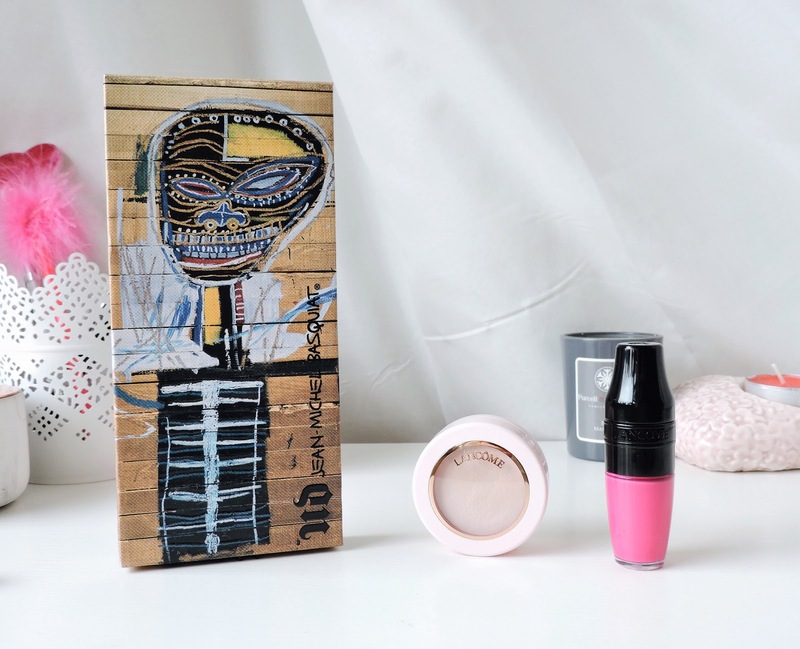 Urban Decay Jean-Michel Basquait Palette: Urban Decay collaborated with Jean-Michel Basquait, a world renown artist who rose to fame in the '80's. My favourite thing about this palette is the fact when the palette is completely finished, there's a hook in the back, so you can hang it on your wall as one of his masterpieces. 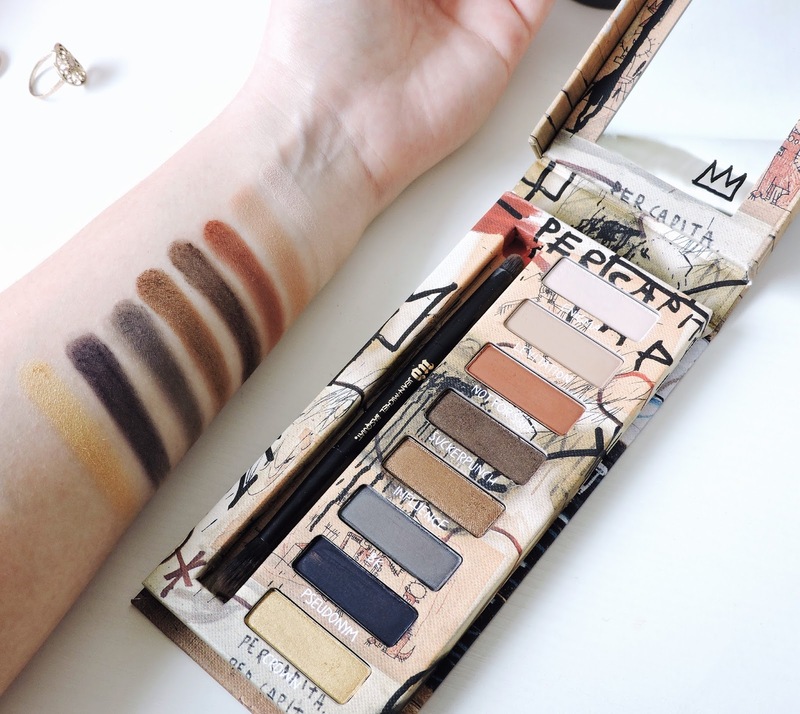 The formula is extremely pigmented as you can see in the photo below and they blend very well together. There is a lot of fallout so a little goes a long way. Love it! Lancome Blush Subtil Crème: I got the shade 'Je m'appelle rose' in number 4, which, as you can see in the photo, is a very light pink blush. The idea behind these blushes is to use them as contour. For me as this colour is so bright I have used it as a subtle highlighter and I love it. 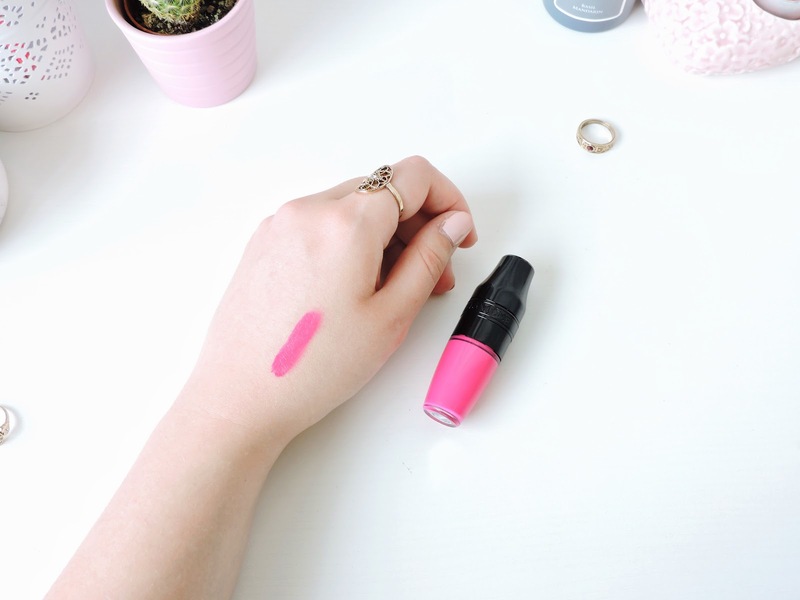 Lancome Matte Jucy Shaker: When I saw these lipsticks come out on the market last year I was quite sceptical of how they would apply but when I finally got my hands on them I could see just how great of an invention they are. To apply the product to the applicator you must shake it like a cocktail shaker. It doesn't streak and it dries very nicely. An aspect that can be taken as a pro or a con is, it doesn't come off! I had the stain of the product on my hand for days even after 15 washes and 2 showers! When removing it use oil or it won't come off.